Determined to sever his ties with the Office, Gabriel Allon has retreated to the windswept cliffs of Cornwall with his beautiful Venetian-born wife Chiara. But once again his seclusion is interrupted by a visitor from his tangled past: the endearingly eccentric London art dealer, Julian Isherwood. As usual, Isherwood has a problem. And it is one only Gabriel can solve. In the ancient English city of Glastonbury, an art restorer has been brutally murdered and a long-lost portrait by Rembrandt mysteriously stolen. Despite his reluctance, Gabriel is persuaded to use his unique skills to search for the painting and those responsible for the crime. But as he painstakingly follows a trail of clues leading from Amsterdam to Buenos Aires and, finally, to a villa on the graceful shores of Lake Geneva, Gabriel discovers there are deadly secrets connected to the painting. And evil men behind them. Before he is done, Gabriel will once again be drawn into a world he thought he had left behind forever, and will come face to face with a remarkable cast of characters: a glamorous London journalist who is determined to undo the worst mistake of her career, an elusive master art thief who is burdened by a conscience, and a powerful Swiss billionaire who is known for his good deeds but may just be behind one of the greatest threats facing the world. 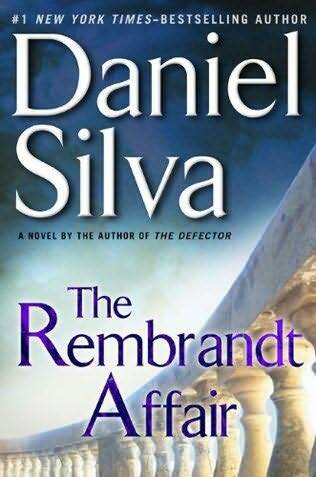 Filled with remarkable twists and turns of plot, and told with seductive prose, The Rembrandt Affair is more than just summer entertainment of the highest order. It is a timely reminder that there are men in the world who will do anything for money. Visit Daniel Silva’s website, Facebook and Twitter. Instead of a review, the author has asked me a series of fun questions. Check out the interview! If you were to write a blurb in fewer than three sentences for THEÂ REMBRANDT AFFAIR, what would it be? This book has action, adventure and some interesting twists and turns! Gabriel Allon is a talented spy and assassin, but also a master art restorer. If you could have two careers that seem to be complete opposites, what would they be? I would be a chef and an Olympic athlete – I could make the richest food that I’d savour and then work it off as quickly as I ate it! What three words would you use to describe the character of Gabriel Allon? THE REMBRANDTAFFAIR takes the reader all over the world. Of all the locations mentioned, which would be your ideal vacation spot? I’d love to go to any of the spots in England that are mentioned – I think they would be really beautiful! Art theft plays a major role in the novel. If no crime were involved, what piece of art would you like to have in your home? I would love any of the paintings by Monet because they are all simply gorgeous! Zoe Reed is a powerful female character in the novel. Tell us about an influential woman in your life. I had a teacher in high school who had the greatest influence on me. She was a strong woman with a dry sense of humour and she was also brilliant! Who was your favorite good guy in THE REMBRANDT AFFAIR and why? I actually think of Gabriel Allon as a “good guy” so he would be my choice! All of the technology discussed in the novel is real. Does any of it surprise you? Nothing surprises me about technology these days – the things that can be done are simply mind-boggling! What celebrity would play Gabriel Allon if THE REMBRANDT AFFAIR were on the big screen? I would have to say Pierce Brosnan because I think he would bring a sophistication to the role that embodies Gabriel. 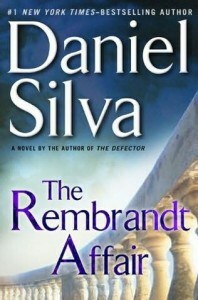 Which fellow book-loving, blogging friend do you think would enjoy THE REMBRANDT AFFAIR? Tag them here and we will mail a finished copy of the novel! I love it! Thanks so much for being on the tour. I hope you enjoyed the different format! Please send me your ‘tagged bloggers’ address so that I can have the book shipped off to her asap. Hey there, I am your newest follower. I love reading and will have to give that book a try. Thanks for the recommendation. Hope you’ll visit my blog as well. Thanks.